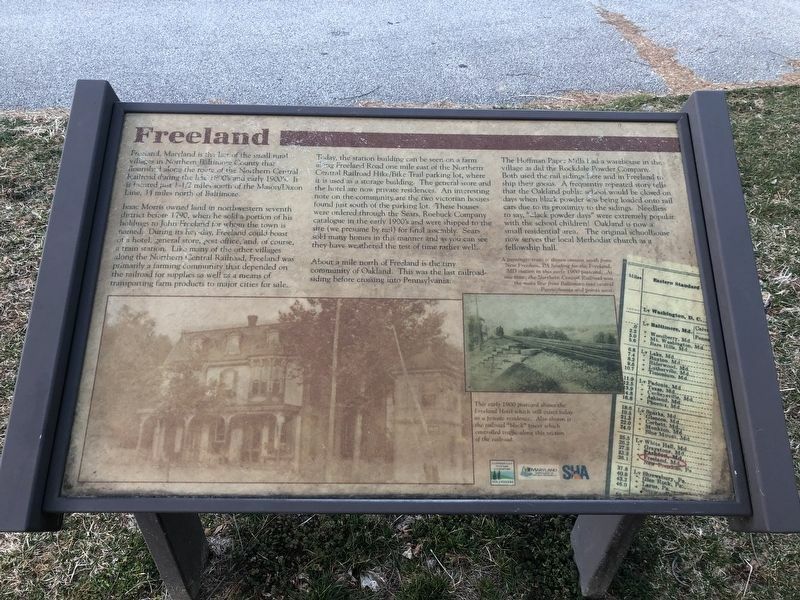 Freeland, Maryland is the last of the small rural villages in Northern Baltimore County that flourished along the route of the Northern Central Railroad during the late 1800's and early 1900's. It is located just 1-1/2 miles south of the Mason/Dixon Line, 34 miles north of Baltimore. Isaac Morris owned land in northwestern seventh district before 1790, when he sold a portion of his holdings to John Freeland for whom the town is named. During its hey-day, Freeland could boast of a hotel, general store, post office, and, of course, a train station. Like many of the other villages along the Northern Central Railroad, Freeland was primarily a farming community that depended on the railroad for supplies as well as a means of transporting farm products to major cities for sale. through the Sears, Roebock Company catalog in the early 1900's and were shipped to the site (we presume by rail) for final assembly. Sears sold many homes in this manner and as you can see they have weathered the test of time rather well. About a mile north of Freeland is the tiny community of Oakland. This was the last railroad-siding before crossing into Pennsylvania. The Hoffman Paper Mills had a warehouse in the village as did the Rockdale Powder Company. Both used the rail sidings here and in Freeland to ship their goods. A frequently repeated story tells that the Oakland public school would be closed on days when black powder was being loaded onto rail cars due to its proximity to the sidings. Needless to say, "black powder days" were extremely popular with the school children! Oakland is now a small residential area. The original schoolhouse now serves the local Methodist church as a fellowship hall. A passenger train is shown coming south from New Freedom, PA heading for the Freeland, MD station in this early 1900 postcard. at one time, the Northern Central Railroad was the main line from Baltimore into central Pennsylvania and points west. This early 1900 postcard shows the Freeland Hotel which still exists today as a private residence. Also shown is the railroad "block" tower which controlled traffic along this section of the railroad. Erected by Gunpowder Falls State Park, Maryland Department of Natural Resources, State Highway Administration. Location. 39° 42.365′ N, 76° 40.989′ W. Marker is in Freeland, Maryland, in Baltimore County. Marker is on Freeland Road north of Railroad Avenue, on the left when traveling north. Touch for map. Marker is at or near this postal address: 1053 Freeland Road, Freeland MD 21053, United States of America. Touch for directions. Other nearby markers. At least 8 other markers are within 4 miles of this marker, measured as the crow flies. Mason and Dixon Line (approx. 1.7 miles away); Mason and Dixon Mile Stone (approx. 1.7 miles away); Summit Grove (approx. 2.2 miles away in Pennsylvania); All Aboard! (approx. 2½ miles away in Pennsylvania); Homes on Wheels, Mobile Offices (approx. 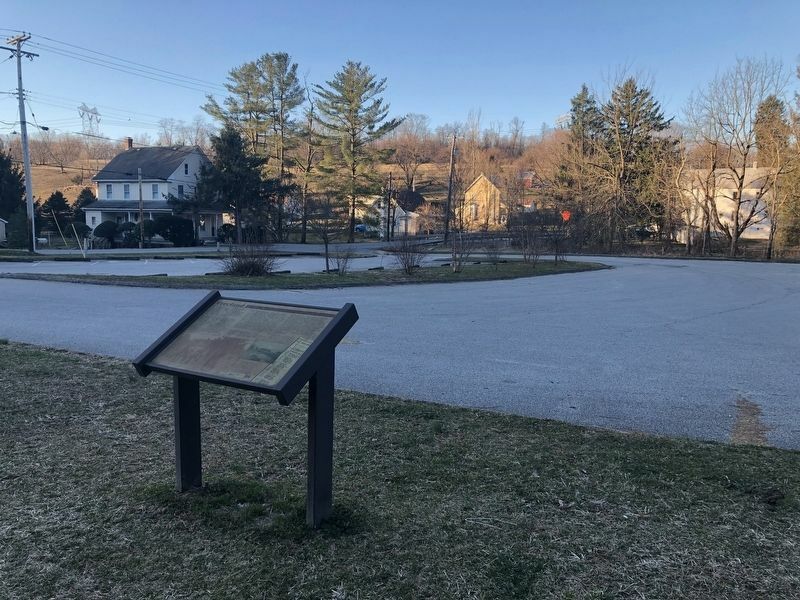 2½ miles away in Pennsylvania); The Farmer's Town (approx. 2.6 miles away in Pennsylvania); Virginia Hall (approx. 4 miles away); Spurgeon Milton Keeny (approx. 4.1 miles away in Pennsylvania). More. Search the internet for Freeland. Credits. This page was last revised on March 23, 2019. This page originally submitted on March 23, 2019, by Devry Becker Jones of Washington, District of Columbia. This page has been viewed 96 times since then. Photos: 1, 2. submitted on March 23, 2019, by Devry Becker Jones of Washington, District of Columbia.